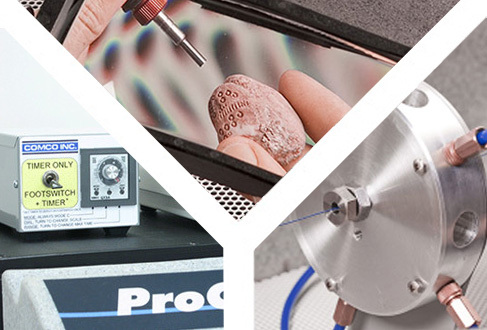 Comco offers a range of tools and accessories to enhance your MicroBlasting system, including magnifiers, the Blast Timer, AutoFill, the Nozzle Alignment Laser, and the Ring Nozzle. Save time and reduce uncertainty with these essentials. Our Sales Team can help you optimize your system and create the ideal blasting environment. Contact us to learn more. The Magnifier boosts visibility without impairing the ergonomic design of your workstation. Why use the Magnifier? Provides 2.5x magnification, which reduces eyestrain and allows comfortable work on small and intricate parts. Provides 8-10″ depth of focus, which allows parts to be held at a distance from the WorkStation window for unencumbered movement while blasting. Mounts easily with VELCRO tape strips for simple removal and reattachment. 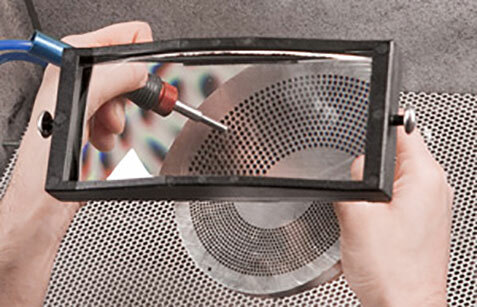 Overblasting may damage a part. 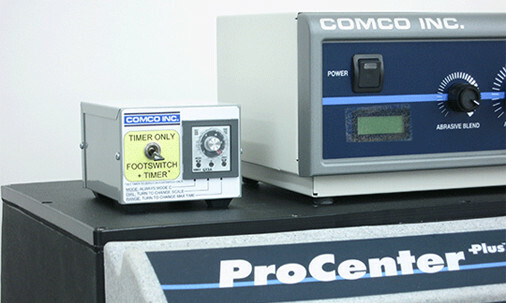 Comco’s Blast Timer helps prevent overblasting by controlling the length of the blast. When the operator steps on the foot-switch, the blaster runs until the Blast Timer halts the abrasive stream, even if the foot pedal remains depressed. This trusted companion increases control over the blasting process and provides a higher degree of repeatability. 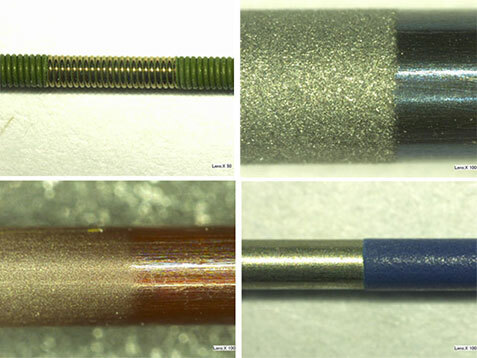 Comco’s Ring Nozzle, powered by Comco’s DirectFlo™ or PowerFlo®, is designed to uniformly texture or remove coatings from a wire, rod or similarly long, cylindrical part. 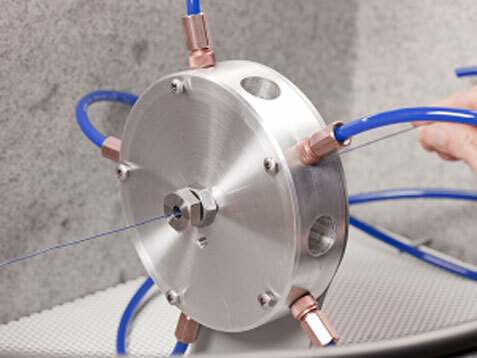 It spreads abrasive flow uniformly through five nozzles over a circular cross-section and eliminates the need for the rotation of wires or parts usually required in a single nozzle set-up. Designed for both reel-to-reel wire and wire-end applications, the Ring Nozzle creates a sharp delineation without the need for masking. Never stop to refill the tank again! 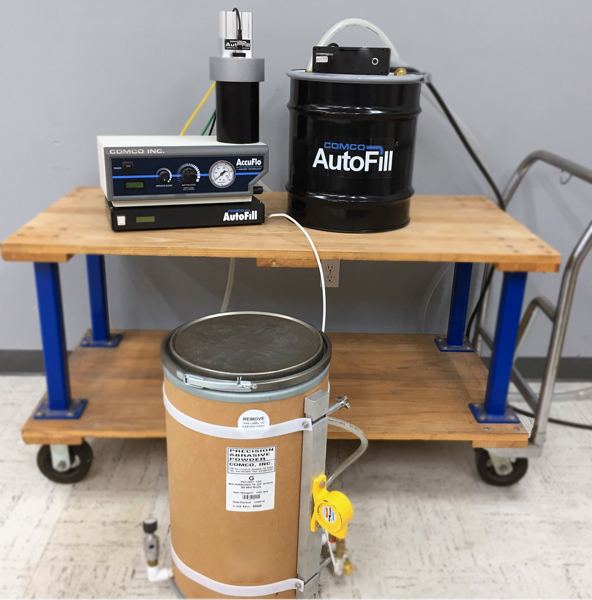 Comco’s AutoFill monitors the amount of abrasive in a blaster’s tank. When the abrasive is low, AutoFill replenishes the tank with no operator involvement. AutoFill is an add-on module for the Tall-Tank model AccuFlo. 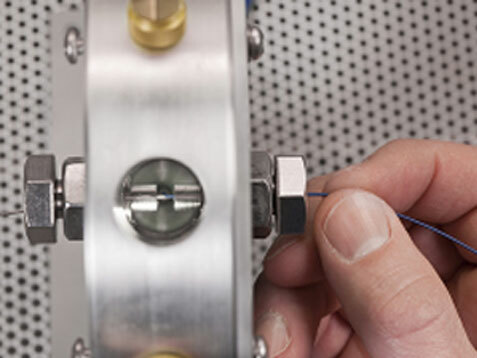 When attached to the back of any Comco nozzle, the Nozzle Alignment Laser places a dot on the surface of the part where the abrasive will strike. Once alignment is set, simply remove the Nozzle Alignment Laser and attach the abrasive hose.